Radiator Repair should only be done when the Engine is Cold. Radiator Repair can be done in several ways. 6 methods are listed below. Some Radiator Repairs are quick and cheap but not permanent. Other Radiator Repairs are more expensive but last. A Car Radiator is made up of many thin pipes. Car Radiator Coolant (Green or Orange Liquid) is pumped through these pipes by a Car Water Pump. Coolant is hot as it has been flowing around tunnels in the hot engine before it got to the Radiator. As the Coolant flowed it picked up the heat from the engine. Radiator Pipes are surrounded by little bits of space filled with air. The pipes give the heat from the Hot Radiator Coolant to the air. As the air gets warm it must be replaced by new cooler air. A fan blows new cooler air over the thin Radiator Pipes to replace the old warm air. Liquid cooling systems are pressurized, meaning that the liquid inside the system is under a higher pressure than liquid outside sitting in a container. Air inside a Hot Air balloon is like hot Coolant liquid in that the Coolant wants to expand its container just as the hot air expands the balloon. To make engines efficient (use less gasoline), they have to run at a temperature that heats up the liquid Coolant to the point where it wants to expand. If the Coolant was allowed to expand, then the engine temperature would drop and the engine would use more gasoline. Keeping the engine at the best temperature involves keeping the Coolant contained within the radiator at a higher pressure than the air outside. Hot Coolant in the Radiator is like the air in a blown up balloon. If the Radiator has a hole in it, then the pressure will push the Radiator Coolant out. You would see the same if the balloon you put air in had a hole in it. Maximum amount of pressure that the Coolant can be at is shown by the pressure rating on the Radiator Cap or Coolant tank if no Radiator Cap. Emergency fix for a Radiator Repair when the Engine is Cold. You can leave the radiator cap or coolant tank cap (for newer cars that do not have radiator caps) loose (do not loosen radiator/coolant tank cap on hot engine as you will be sprayed by Hot Coolant liquid which will Burn and Hurt). This will stop the Radiator Coolant from getting to as much pressure in the Radiator. This may stop Radiator Coolant from coming out the holes in the Radiator. You will still loose some Radiator Coolant past the cap. This is a very temporary solution. 2 - Radiator Repair - Simple #1. You can buy from an auto-parts store liquids that will attempt to fill the hole or holes in your Radiator. You add these liquids to your Radiator or Coolant tank when the Engine is Cold. To add you twist open the radiator cap or coolant tank cap on top of the Radiator or Coolant Tank and pour the Stop Leak liquid in. When finished, put the cap back on and close it. If the holes in the Radiator are small enough then this may work. Some people say that pepper put in the radiator will clog the hole or holes and stop the leak. This is similar to what Stop Leak liquids do. We guess that big pepper flakes work best. Add the pepper to the Radiator when the Engine is Cold. Open the radiator cap or coolant tank cap and shake it in then put cap back on and close it. To Replace Radiator it is normally not too hard. The hardness depends on how easy it is to reach and how many bolts hold it in. 1 - Drain Coolant - Most radiators have a tap at the bottom or underneath to drain the Coolant Liquid out. All liquid should be collected for recycling as it is poisonous to the environment and your pets. It is also illegal to dump. Do not store in open / unsecured containers as young children and animals are attracted to the smell and will drink it, likely leading to their death. 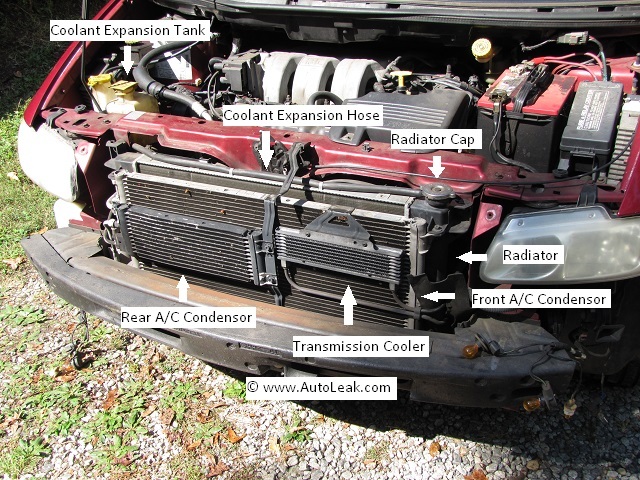 2 - Remove Radiator Hose - A hard part with Radiator Replacement is getting the in Radiator Hose and the out Radiator hose off (after you have drained the coolant). Use a large Oil Filter Wrench with a cloth rag wrapped round the hose to work the hose off. The cloth rag stops the jaws of the wrench from cutting up the hose. You clamp the wrench around the rag on the hose then twist and wiggle it. You want to loosen the hose enough that it will slide off the Radiator. Look at your replacement Radiator to see what you are trying to slide the hose off of. It will show you what direction you should slide the hose in. At some point the hose will start to move and slide off. Make sure to have a container underneath the hoses to catch any coolant not drained out via the Radiator drain tap. 3 - Remove Radiator - You will find that most radiators just have a couple of bolts at the top holding them in place and then they lift out. Some may have other stuff attached. As you lift the Radiator up see if anything else moves with it. If something else moves then you may have to unbolt it from the radiator. Sometimes the Cooling Fan is attached or a plastic cover is attached. These will have to be undone or disconnected to enable you to lift the Radiator Out. Make sure to have a container underneath the radiator to catch any coolant not drained out via the Radiator drain tap. 4 - Replace Radiator - To Replace Radiator just do the opposite of removal. If the Radiator Coolant you drained earlier looks Flourescent Bright Green / Flouresecent Bright Orange and not dirty you can reuse it to save a few bucks. For older cars, hard to find radiators or expensive radiators, you can usually find a shop in the city that might be able to patch the holes in your radiator but it is not cheap. Radiator Repair is also changing as more and more plastic is involved with the radiator. If you have the time, tools and skill you can try to repair a radiator yourself. This would only make sense if you are short on cash, you do radiator repairs for a living, replacement radiator is unavailable, replacement radiator is too expensive to replace or too expensive to have someone else fix it. First remove the radiator as outlined above in replacing a radiator. Using rubber bungs, wood corks with tape to hold them in place, seal the inlets and outlets for coolant. For one of the holes you should also allow air to be pushed in by a pump as this will allow you to locate the leak if you have not found it and to also test your fix. Pump radiator with air (to pressure of radiator cap) and feel for leak of air. Several ways to do this. Area around hole or crack should be sanded and cleaned with acetone. Preparing the area will make the fix more likely to stay. As to what materials to use, there is no reliable one but here are the choices: Epoxy, Soldering Zip Ties (basically melting the plastic Zip Tie into the hole / crack with a soldering iron), Buy a plastic welding kit - 2014 prices is around $70 dollars. Get brazing rod of the type for the metal to be repaired and use torch to melt brazing rod on the leak area.